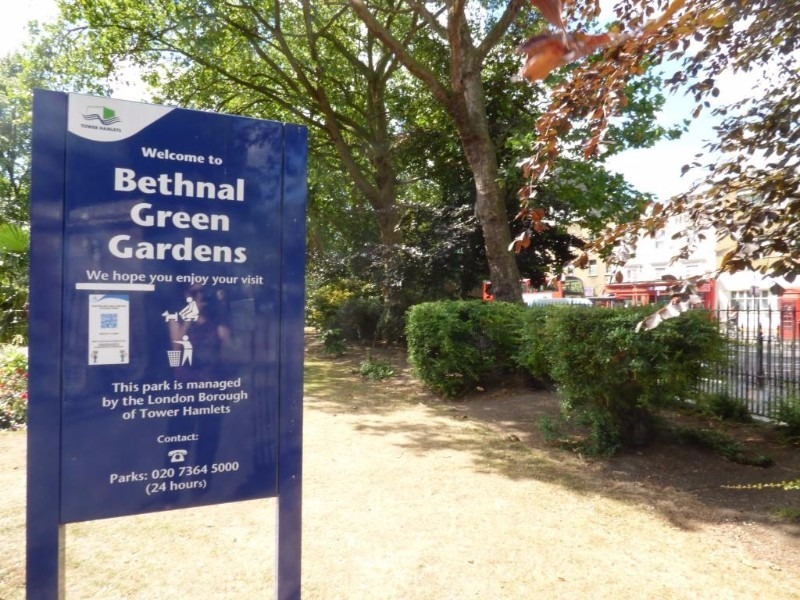 Bethnal Green Gardens is situated just off Cambridge Heath Road opposite Bethnal Green tube station. It is home to the historic Bethnal Green Library and the War Memorial dedicated to the victims, survivors and Emergency Services personnel involved in the Bethnal Green Tube Disaster on the 3rd of March 1943. The park is the 2nd largest in Bethnal Green measuring at roughly 37,000 meters squared . It has many sporting facilities including four tennis courts, basketball courts, a 5-aside football pitch, and netball courts as well as play areas for children of all ages. Bethnal Green Library is on the north-easterly side of the park and was built in 1896 initially as part of an asylum for mentally ill men (some local residents still refer to the area in front of the park as “barmy park”) before becoming a place of learning in 1922. The Victorian House has many interesting historical features such as stained glass windows in remembrance of those who died in World War One and another portraying the famous East-End figure; the Blind Beggar. It also features cameos on the walls of famous individuals such as Karl Marx, Charles Darwin and Richard Wagner. The park also features the ‘Stairway to Heaven’ War Memorial (designed by local architect Harry Paticas) to those that lost their lives on the 3rd of March 1943 as part of what is now known as the Bethnal Green Tube Disaster. It is now considered the worst civilian disaster of World War Two when 173 people were crushed as they tried to enter the station after hearing the air-raid sirens. In the end the alarm turned out to be a test. The building of the memorial is not over and the Stairway to Heaven charity still requires donations to ensure the last survivors of the disaster can see the memorial in its completion (the link is below). Social enterprise studio making handcrafted sustainable leather espadrilles. Buy a pair of limited-edition reclaimed leather shoes, or book a place on our shoemaking courses to design and make your own bespoke espadrilles!